If you ever wondered what OVERKILL would have looked like in the former German Democratic Republic, then here you have it. 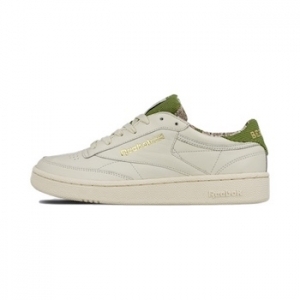 The Berlin-based store heads back in time with Reebok for this 1985-inspired capsule, featuring a buttery soft, off-white leather Club C accented with green corduroy across the tongue and back heel. Both parties logos appear in an embossed gold finish, with “Buckware” imprinted lace keepers, which at the time referred to “hot goods” that were often traded under the counter.